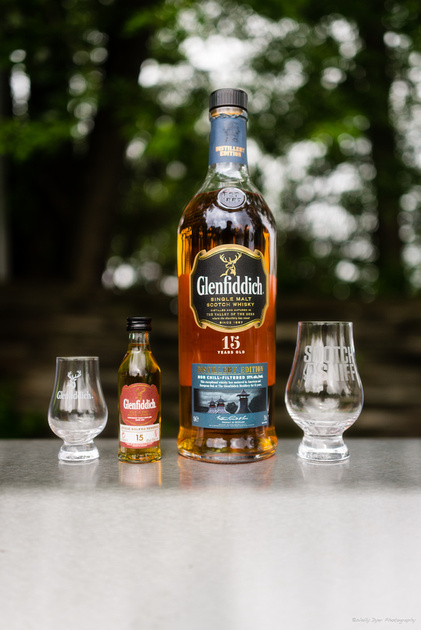 Do you have any idea what it’s like to fly 3400 miles across the globe to hop into a car and drive 60 more miles to the middle of Speyside only to walk into your favorite distillery and find out that all hand-filled bottles are peated that day? Talk about irony if you’re not a fan of peat. lol. The 15 DE is a harvest gold color at 51% abv as opposed to the dark brown leather of the 59% abv 14 hand filled bottle (HFB). The 15 DE’s nose is raw sugar and freshly halved apples drizzled in a simple syrupy mess. Is this heaven?! The 14 HFB is campfire smoke with tree fruit notes hinding behind it. Maybe someone started a bonfire in an apple orchard. This type of smokey peat reminds me much of the friendlier peats like that of Wolfburn and Highland Park. There is no iodine here! The 15 DE is a bullet train to sweet city. 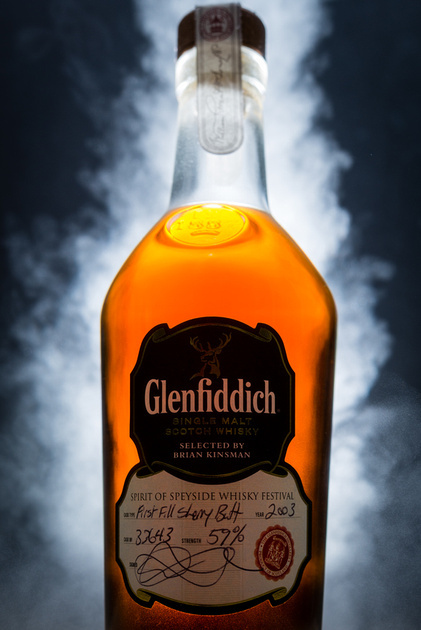 The apples that you might be used to in Glenfiddich offerings have been transmuted into peaches. Soft and sweet at 51% is a nice departure from typical whiskies at this proof. The finish is warm with sprinkles of spices and not much else. It’s a simple dram but dram good. It really makes me want to pair it with peach slices dusted in granulated sugar. The 14 HFB is manageable at 59% but it’s definitely higher in peat content than Highland Park. A second and third sip are letting my palate know that Glenfiddich might have gone a bit far with the peat. Their sister distillery’s 17 Year Peated offering isn’t anywhere near this potent. Wait till you try Balvenie’s 2002 Peat Week. The peat is there but it compliments Balvenie’s honey notes in a good way.